Euchre or eucre is a trick-taking card game most commonly played with four people in two partnerships with a deck of 24, or sometimes 32, standard playing cards. It is the game responsible for introducing the joker into modern packs; this was invented around 1860 to act as a top trump or best bower (from the German word Bauer, "farmer", denoting also the jack). It is believed to be closely related to the French game Écarté that was popularized in the United States by the Cornish and Pennsylvania Dutch, and to the seventeenth-century game of bad repute Loo. It may be sometimes referred to as Knock Euchre to distinguish it from Bid Euchre. Euchre appears to have been introduced into the United States by the early German settlers in the Midwest. and from that region gradually to have been disseminated throughout the nation. It has been more recently theorized that the game and its name derives from an eighteenth-century Alsatian card game named Juckerspiel, a derivative of Triomphe. Also, it may have been introduced by immigrants from Cornwall, England, where it remains a popular game. It is also played in the neighboring county of Devon; one theory is that it was introduced by French or American prisoners of war imprisoned in Dartmoor prison during the early 19th century. Ombre is an ancestral form of Euchre. In the United States the only teaching of the game, except a few paragraphs in the late American editions of Hoyle's Games, and of Bonn's New Hand-Book of Games, is contained in The Game of Euchre; with its Laws, 32mo., Philadelphia, 1850, pp. 32, attributed to a late learned jurist. The game has declined in popularity since the 19th century, when it was widely regarded as the national card game, but it retains a strong following in some regions like the Midwest; especially the states of Indiana, Iowa, Illinois, Ohio, Michigan, and Wisconsin. In recent years, it has regained some popularity in the Eastern United States in the form of Bacon. It is played differently from region to region and even within regions. In Canada, the game is still very popular in Southern Ontario, and the United Kingdom, the Channel Islands, Australia and New Zealand all have large followings of the game. Conventional euchre is a four-player trump game, wherein the players are paired to form two partnerships. Partners face each other from across the table so that the play of the cards in conventional clockwise order alternates between the two partnerships. Conventional euchre uses a deck of 24 standard playing cards consisting of A, K, Q, J, 10, and 9 of each of the four suits. A 52-card deck can be used, omitting the cards from 2 to 8, or a Pinochle deck may be divided in half to form two euchre decks. In some countries, the common 32-card piquet or skat deck is used, which includes the 7s and 8s. Each player is dealt five cards (or seven if using the 32-card deck) in clockwise order in two rounds. The cards may be dealt in whatever pattern the dealer chooses, as long as all cards are dealt two at a time or three at a time. New Zealand club tournament rules specify dealing five cards per player from a 32-card deck using groups of 2 and 3 cards. The remaining four cards are called the kitty and are placed face down in front of the dealer toward the center on the table. The top card of the kitty is then turned face up, and bidding begins. The dealer asks each of the other players in turn if they would like the suit of the top card to be trump, which they indicate by saying "pick it up" or "pass" (knocking on the table is often substituted for vocalizing a pass). If the choice comes around to the dealer, the dealer can either pick the card up or flip it over. If the dealer acquires the top card (either by being ordered up or choosing to pick it up), the top card becomes part of the dealer's hand, who then discards a card to the kitty face down to return their hand to five cards. If no one orders up the top card and the dealer also chooses not to pick it up, each player is then given the opportunity, in turn, to call a different suit as trump. If no trump is selected, it is a misdeal, and the deal is passed clockwise (unless it was agreed upon to play stick the dealer, an option that involves forcing the dealer to choose a trump). When a suit is named trump, the jack in the suit of the same color as this trump suit becomes a powerful member of this trump suit. Then any card of that (expanded) suit outranks any card of a non-trump suit. 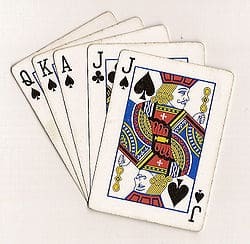 The highest-ranking card in euchre is the Jack of the trump suit (called 'The Right Bower' or 'Right') then the other Jack of the same color, (called 'The Left Bower' or 'Left'). The cards are ranked, in descending order, J (of trump suit) J (same color as trump suit) A, K, Q, 10, and 9 of the trump suit. The remaining cards rank in the usual order (the off-color jacks are not special) and the cards of those suits rank from high to low as A, K, Q, J, 10, and 9. Here, the jack of clubs becomes a spade during the playing of this hand. This expands the trump suit to the seven cards named above and reduces the suit of the same color (sometimes referred to as the next suit) by one card (the jack is loaned to the trump suit). The same principles are observed for whatever suit is named trump. Remembering this temporary transfer of the next suit's jack is one of the principal difficulties newcomers have with the game of euchre. Once the above hand is finished, the jack of clubs ceases to be a spade and becomes a club again unless spades are again named as trump during the playing of the subsequent hand. Depending on regional or house rules, a player may steal the deal from the opposing team. To steal the deal, the partner of the previous dealer collects the cards, shuffles and deals as normal. If the opponent team does not notice that they have been skipped before dealing is finished then game play proceeds as normal. If the opponent team notices, they must say something which indicates this, and the deal is returned to the player who would normally deal next in the rotation. Normally there is no penalty for attempting to steal the deal, successful or not, and the next hand is dealt by the player to left of the player who stole the deal. In euchre, naming trump is sometimes referred to as making, calling, or declaring trump. When naming a suit, a player asserts that his or her partnership intends to win the majority of tricks in the hand. A single point is scored when the bid succeeds, and two points are scored if the team that declared trump takes all five tricks. A failure of the calling partnership to win three tricks is referred to as being euchred, set or "bumped" and is penalized by giving the opposing partnership two points. A caller with exceptionally good cards can go alone, or take a loner hand, in which case he or she seeks to win all five tricks without a partner. The partner of a caller in a loner hand does not play, and if all five tricks are won by the caller the winning team scores 4 points. If only three or four of the tricks are taken while going alone, then only one point is scored. If euchred or set while playing alone, the opposing team still only receives 2 points. Once the cards are dealt and the top card on the kitty is turned over, the upturned card's suit is offered as trump to the players in clockwise order beginning with the player to the left of the dealer (called the "eldest"). Team members are generally discouraged or explicitly forbidden to discuss their preferred choice(s) of trump, categorized as a part of the rules for no table talk. If a player wishes the proposed suit to be named trump, he orders up the card and the dealer adds that card to his hand. It is more advantageous to the dealer's team to select trump in this way, as the dealer necessarily gains one trump card. The dealer must then also discard a card face down from their hand in order to return his hand to a total of five cards. This discard is an important tactical decision, as the dealer can potentially create a "void" in their hand, where they lack any cards of a particular suit. That would allow them to play a trump card instead of being forced to follow that voided suit when it is led (see the later section on winning tricks and "two-suited" in Terminology). If the player instead opts to pass, the option proceeds to the player to the left until either a player orders the card up or all players have passed. If all players pass, the top card is turned face down and that suit may no longer be chosen as trump. Trump selection proceeds clockwise beginning with the player to the left of the dealer where the player may name a suit different from that of the previous up-card as trump, or they may pass. No card is ordered up in this round. If all players pass again, it is declared a misdeal. The deal passes to the player on the previous dealer's left who reshuffles and deals a new hand. The team that selects trump is known as the makers for the remainder of the hand, and the opposing team is known as the defenders. The makers must take at least three of the five tricks in the hand in order to avoid being euchred. The player to the dealer's left begins play by leading any card of any suit. The player may lead with trump. Play continues in clockwise order; each player must follow suit if they have a card of the suit led. The left bower is considered a member of the trump suit and not a member of its native suit. The player who played the highest card of the suit led wins the trick, unless trump is played, then the highest trump card wins the trick. Players who play neither the suit led nor trump cannot win the trick. The player that won the trick collects the played cards from the table and then leads the next trick. After all five tricks have been played, the hand is scored. The player to the left of the previous dealer then deals the next hand, and the deal moves clockwise around the table until one partnership scores 10 points and wins the game. If the player bidding (making trump) has an exceptionally good hand, the player making trump has the option of playing without his or her partner. If the bidder playing alone wins all five tricks in the hand, the team scores four points. "Going alone", "going solo", or "playing a lone hand," is initiated at the time the bidder orders the upturned card on the kitty to the dealer or names a suit. The bidder signifies his or her desire to play alone by saying so after bidding. The bidder must make this call before play begins. During a loner, the bidder's partner discards his or her cards, and does not participate in play of the hand. The odds of success of a loner bid depend on the lay of the cards and the inactive cards held by the bidder's partner. Nine cards out of twenty-four do not participate in play, making the hand less predictable than otherwise. A hand consisting of the top five cards of the trump suit is mathematically unbeatable from any position; this is sometimes referred to as a lay-down, as a player with such a hand may often simply lay all five cards on the table at once. The first team to score 10 (sometimes 5, 7, 11, or 15) points wins the game. Some players choose to play win by two where there is no winner until a team has more than 10 points and 2 points more than the other team. Winning a game 10-0 is known as skunking. Scores are kept by using two cards, typically the four and six card of any suit. Using the five cards of the same colour with one team choosing a red suit and the other a black suit also is acceptable. Scoring begins using the six card (face up), covered by the four card (face down). Upon winning points, the four card is moved to reveal the appropriate number of suit symbols on the six card. After six points, the four card is flipped up and covered by the six card, showing pips on both cards to total the score. A variation of score keeping in Western New York involves using the 2s and 3s of the same suit. Scoring starts with counting the symbols on the cards, for points 1-4; at 5, the cards are turned over and crossed. Crossing the cards indicated 5 points. Points 6-9 are counted similarly by counting the number of suit symbols showing and adding them to the 5, if cards are crossed. When placing bets on a euchre game, betting takes place after the trump is determined, and before the first card is played on that trick. Betting can start with an ante or forced bet. The defenders can either check on the bid and bid nothing, thereby likely losing their ante, call the bid, or if they feel confident that they can euchre - raise the bid. Once a bet has been settled by a call on the bid, the trick plays out, with the winners of the bet adding that bet to their pot. After the game has been won, the winning team then splits the pot between the two winners and the game can end there, or variants can be played over multiple games. Betting in euchre can also be done on a per trick basis or a per point basis. At the end of the game, the losing team owes the winning team the difference in points based on the monetary value set per point. Communicating with one's partner to influence their play, called table talk or cross-boarding, is considered cheating which should be emphasized to new players. This can include code words, secret gestures, or other forms of cooperative play in which one player can inform his partner what he holds in his hand or what the partner should play in a trick or call when choosing trump. Depending on house rules, table talk can result in replaying of a hand or awarding of a point to the team calling out the infraction. Some variations allow (or at least accept the inevitability of) the minor non-verbal communication in that a player may hesitate before passing on trump selection to signal to his partner that his cards are helpful to the offered trump, but are not sufficient to guarantee a win. Conversely, the player may pass quickly or blatantly to indicate their cards are very poor for the available trump choice (possibly indicating their partner should go alone if they select that trump). This adds an additional element of strategy in that players may bluff a quick pass or hesitation to trick their opponents into calling or declining the offered trump; however, this can naturally backfire by confusing the player's own teammate. Depending on the play group, couples or good friends may be purposely split on to opposing teams because of the perceived advantage they may have reading one another if teammates. If a player does not follow suit when he is able to (usually by playing a trump card instead), it is considered a renege and cheating, and the opposing team is rewarded two points if it is caught in later tricks of the same hand. However reneges can also be unintentional, where a player misreads some of his/her cards, most commonly by misinterpreting the left bower as being of its native suit, but are still callable by opponents as reneging. In some variants reneging when a player or his opponent is going alone may result in a penalty of four points in order to equalize the potential values of a hand. The four point penalty for reneging should apply equally for the maker of trump and the opposing team. After the first round (once the kitty's top card had been turned down), it is also possible to choose "No trump", in which case each suit retains its normal order (ace being the highest card of the suit). There is naturally no way to cut a given suit in this variant, hence the first played card will make the trick, provided it is the highest remaining card in this suit. 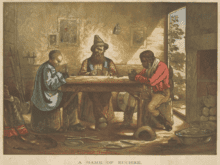 Shows three men, Jack the black packer, "Harry my friend" the digger and Ah Sin the Chinese fossicker playing euchre. Ah Sin won. Euchre is a game with a large number of variant versions.They include versions for two to nine played, as well as changes in cards used, bidding, play, and scoring. Players may decide before the game begins to play by the "stick the dealer" (or "screw the dealer") rule. In that case, the dealer may not pass in the second round but is required to call trump. Thus, with that rule there are no misdeals. Going Under: One variation, when agreed upon is "bottoms" or "going under". A player having a hand consisting of 3 nines or 3 tens or any variation of these cards in this amount can request bottoms, trading the three cards with the 3 facedown cards in the kitty. Many of these variations are specific to a particular region. In Australia and New Zealand, playing to 11 rather than 10 points is common. In southwestern England and Guernsey, variations with a joker as highest trump are played. In Ontario and parts of NZ after the dealer turns up the top card on the kitty if the first player to the left passes and the dealer's partner would like to order up the dealer, the dealer's partner must play alone. Of growing regional popularity is a variant of Euchre rules termed, "Robson Rules" named for 4-time Northern Michigan regional tournament runner-up champion James Robson (incidentally, tournament champion Dave Golnick prefers to also utilize these rules). "Robson Rules" are particularly aimed toward altering scoring rules and include a point-earning team's option to set an opponent's score "back" (reduce the number of points) instead of advancing their own score after a 2- or 4- point win. Additionally, dealers who "turn up" a jack on the kitty are afforded the option of a "Blind Loner," whereby the dealer may call a lone hand in the appearing suit before looking at his hand. A successful "Blind Loner" is awarded 5 points, whereas setting a "Blind Loner" earns the defenders only a single point. Euchre/Getting "Set": Occurs when the opposing team wins more tricks than the team who called the suit. Farmer's Hand/Poor Man's Hand/Bottom Hand: Certain weak hands (usually those containing no face cards, either three 10 cards or three 9 cards) are designated as "farmer's hands" or "bottoms." After inspecting the hand dealt, a player may call out "farmer's hand" and is then allowed to show the three cards in question and exchange them for the three unexposed cards in the kitty (also called "going under" or "under the table"). Ace No Face: Similar to "farmers hand". In ace no face the player must have one ace and all nines and tens in his hand. The player then call "ace no face" and exchange three of his cards for the bottom three (must be called before the first card of the beginning trick has been laid). Euchre Bustle: Name for a tournament of Euchre (used in USA northern midwest). Lay-Down: A hand that will automatically win all five tricks if played in the correct order; ex. a Dutchman (both bowers and Ace of trump) plus, the king and queen of that suit, any other two trump cards, or one more trump card and an off-trump ace (when that player has the lead). Also called a Loner, or Lone Wolf, because a player with such a hand will typically opt to go alone. May also refer to any set of cards that are often played simultaneously when the player knows he will win all the tricks he lays for. This however may only be done within the same suit without giving up a slight advantage to the other players. Screw the Dealer or Stick the Dealer: An optional rule that states that if trump is failed to be called it must be called by the dealer, who is last to act. Mainly used as a method to speed up the game, as it eliminates throw-in hands. Trump the Partner: Refers to a situation where the last player plays the card that wins a trick that his partner would have otherwise won. Usually refers to a situation where the partner has an Ace that follows suit and the player plays a trump card, but playing a higher trump or non-trump than the partner's qualifies. It is generally accepted strategy to throw a low off-suit card rather than a trump when the partner is guaranteed to win the trick otherwise.